Thomas Szasz died at 92 on September 8, 2012. With his death, many of us, not enough, are left with deep concern about his legacy and the continuing influence of his ideas. Here, following a biographical sketch, I discuss some of the myriad ways his ideas have directly or indirectly influenced my ongoing work as a psychologist. I hope that my experience will have a small positive effect in keeping alive and in play the profoundly important ideas of this great man. Szasz became a psychiatrist with the thought of launching an attack on psychiatry that would end or at least significantly reduce the use of civil commitment and the insanity defense. He stayed true to this goal throughout his life. At the same time, he would not advise another to follow in his footsteps. Nevertheless, he has educated and inspired me, hence the focus of this book is on how his work influences my own. I have been involved in the so-called mental health field for about 40 years. My first job after graduating from college with a bachelor’s degree in psychology in 1975 was in a residential treatment center for children. During my three years there I learned about the systematic drugging of children, which even then was not uncommon. Like Szasz in his choice of a residency in psychiatry, I went on to study psychology in graduate school because I wanted to work with people. 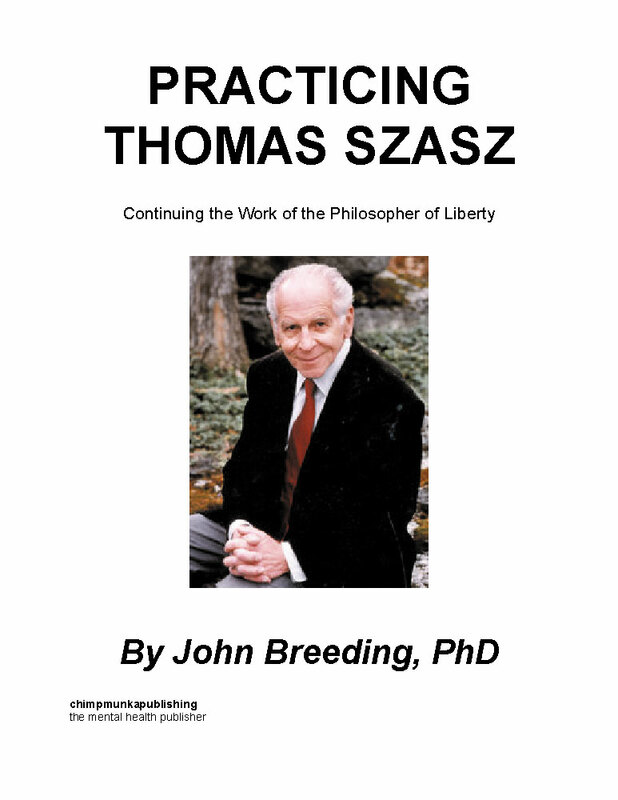 I knew that there were problems with the profession I was entering, that people in the field were engaged in unethical, harmful practices, but was not nearly as clear as Szasz in my understanding of the profession; nor did I have, like him, an agenda to completely expose and preferably destroy coercive psychiatry. John Breeding, Ph.D., is a counseling psychologist, professor, writer, speaker and activist in Austin, Texas. John works with a wide range of people in various venues ranging from office and telephone counseling and consultation to workshops and public speaking. A significant part of his work is to assist adults in becoming more effective in their work with young people, offering non-drug alternatives to helping young people who are having a hard time. 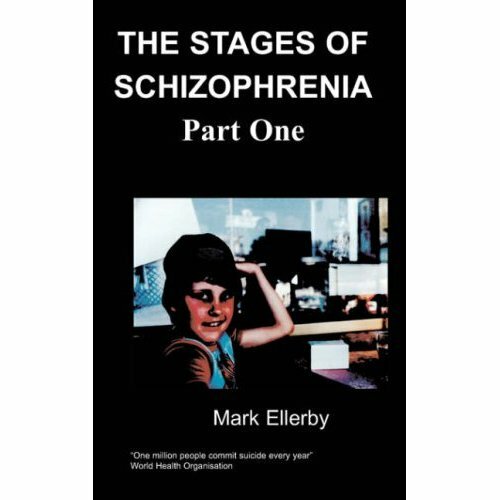 He works hard to challenge the ever-increasing role of biological psychiatry, especially psychiatric drugs, in the schools and in society at large. Dr. Breeding is also active on other challenges of psychiatric oppression, including electroshock (see www.endofshock.com) and psychiatric coercion. His website, www.wildestcolts.com, is a great resource on parenting, psychology and psychiatry. Dr. Breeding is the author of five other books: The Wildest Colts Make the Best Horses, The Necessity of Madness, Unproductivity: Psychiatric Oppression or Human Transformation, True Nature and Great Misunderstandings, Eyes Wide Open and Leaving Home. John is also exceedingly proud of his own three young adults—Eric, Vanessa, and Gardiner. His experience learning from these three awesome individuals and letting them go, along with countless other young people, has been the inspiration for Leaving Home: The Journey From Birth To Emerging Adulthood. Psychiatrists and the courts serve a political function of defining power and control in society. However, most times they are responding to the daily dramas of family struggles and conflicts, as compared to dealing with overtly political power politics. These cases do happen, however, even within my own limited experience. One is the case of Rodney Yoder. Alaska attorney James Gottstein’s (2001) legal memo is a good summary of Yoder’s case up to that time. I just want to make a few brief points here. In December 2002, I testified at Yoder’s commitment hearing in Illinois. The situation, according to court records, was that the public was protected from a very dangerous, psychotic man via the mechanisms of law and psychiatry; he had been held under a series of involuntary commitment orders since July of 1991, over a decade, after completing a short prison stay on an assault charge. His psychiatric hospitalization was considered necessary for the safety of the public, and for Yoder’s own good. This was reaffirmed in the 2002 trial, despite a strong effort by attorney Randy Kretchmar, and the testimony of Fred Baughman and myself among others. The biggest challenge to the official story consists of the presence of Rodney Yoder. Yoder consistently and persistently refused to acknowledge his “illness” or cooperate with the authorities in any way. He called his hospitalization imprisonment, the doctors his captors and the treatment they forced on him torture. He demonstrated his mental competence by arguing and winning various legal appeals during incarceration. He organized the mobilization of a significant movement of activists on the outside, including recruitment of a lawyer and “experts” like Baughman and myself. All this was accomplished mostly with letters scrawled in pencil from his prison cell. During the December trial, I was privileged to observe the demonstration of Yoder’s intellectual competence in the testimony he gave. Throughout the stressful situation, Yoder kept his cool and delivered the best treatise on the theory and practice of psychiatric oppression I’d ever heard from anyone other than Thomas Szasz. There is a clear presumption of guilt when it comes to declarations of mental illness by a psychiatrist, and prosecutors and judges are generally very strong about the inability of persons deemed mentally ill to determine their own best interests. No matter how clear and rational a person may seem, they are disregarded. If the person is a bit emotional or “inappropriate,” it becomes even easier to condescendingly disregard; if the person accuses his helpers of torture and torment, and calls his “hospital” a psychoprison as Yoder did, he is most definitely severely mentally ill. And if on top of that, he coolly and intelligently lays out a Szaszian analysis before a kangaroo court, he is even crazier and more dangerous. An important truth about any trial situation is that experts are compromised because both sides will buy an expert who states their opinion. As a result, each side cancels out the other. On this particular battle of challenging the validity of biopsychiatry, however, just as in the courts in general, it gets even worse in that so often the challengers have to work on a volunteer basis since defendants are usually poor and therefore unable to hire attorneys and expert witnesses to take their side. The state or the insurance or drug companies, on the other hand, have the financial resources to hire experts, often the best that money can buy. For example, the state spent at least $100,000 on the December involuntary commitment trial for Rodney Yoder, and the defense consisted of a volunteer lawyer and experts. In the end, the result tends to be the same since the judges are agents of the state whose job is to defend customary and usual practice. Anyone who could see and hear Yoder during that trial, and who still declares him dangerously mentally ill, simply cannot and/or will not see reality for what it is. The reality those jurors (all inhabitants of a town almost totally dependent on the prison industry) see is mightily distorted.